Nested 25 miles west of the Santa Clarita Valley, Bennett’s Honey Farm has been dedicated in providing 100% pure raw gourmet honey. 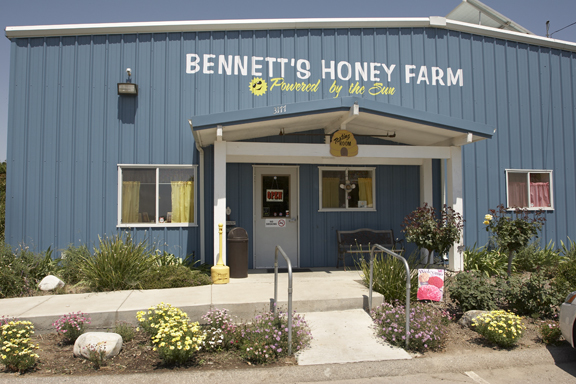 Bennett’s Honey Farm, located in the city of Fillmore, was founded by Red and Ann Bennett, and it has ever since been family owned bee-siness under the operation of Chip and Taydee Vannoy. Although their process of honey filtration, known as “gravity straightening,” takes longer than conventional methods, Bennett’s Honey Farm believes this gradual process is worth the wait. This is why Bennett’s Honey Farm is home to Topanga Quality Honey. Your family will have an un-bee-lievable time visiting Bennett’s Honey Farm. They are open seven days a week, and you will have the chance to taste the highest quality honey in the Ventura County. Best of all, you will be able to take part of your taste experience home by purchasing a variety of bee made products. From honey sticks to beeswax skin cream, there is a lot for the whole family. Most importantly, Bennett’s Honey Farm has both Kosher and Organic certifications so that all your needs can be met. Staying true to its all natural name, Bennett’s Honey Farm is run by natural power. 100 percent of the farm is run by 100 percent of power from the sun. Not only does Bennett’s Honey Farm offer residents a fun place to hang out on the weekend, but Bennett’s Honey Farm also offers business services for small operation beekeepers. Three services offered Bennett’s Honey Farm are honey extractor, honey bottling, and private labeling. In addition, Bennett’s Honey Farm will be glad to provide design recommendations for labels and packaging. Looking for family fun outside of the Santa Clarita Valley? Looking for something new and tasty to do? Visit Bennett’s Honey Farm for an experience that will “bee” better than what you expect. It is located right off State Route 126 in Fillmore. Don’t miss out on all the buzz, so visit the Bennett’s Honey Farm booth at the Santa Clarita Home & Garden Show in Central Park.